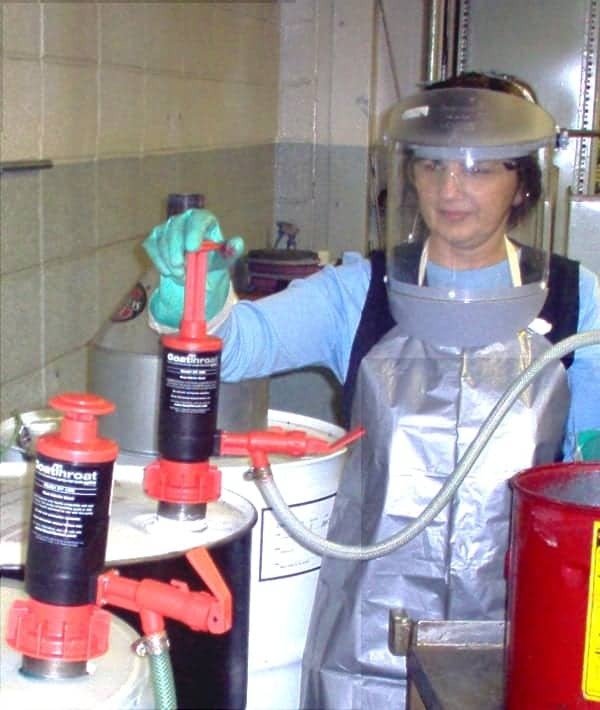 Every day industrial workers transfer potentially hazardous chemicals, such as solvents, acetones, lubricants, cleansers, and acids, from large drums into smaller containers, or into machinery. This transfer of chemicals at the point of use, however, can have serious consequences when manual “tip‐and‐pour” techniques or poorly designed pumps are used. Whether the chemicals are toxic, corrosive, reactive, flammable, emit volatile organic compounds (VOCs), or are even potentially explosive, the danger of accidental contact, even for short periods, can pose a severe hazard to workers. In addition to the potential for injury, there can also be serious financial ramifications for the facility involved. The risks include cost to treat injuries or perform cleanup, as well as workers’ compensation claims, potential liability, OSHA fines, loss of expensive chemicals and even facility/production shutdown. Corrosive chemicals, for example, can burn skin or flesh. Some chemicals are toxic when touched or inhaled. Cyanotic agents, for instance, can be particularly dangerous or even fatal, since they rob the body of oxygen. Many chemicals are flammable as well and can be ignited by even the smallest spark from nearby motors or other mechanical equipment. “There is no such thing as a small fire in my business,” says Grubbe. Small, versatile, hand‐operated pressure pumps, such as those manufactured by GoatThroat Pumps, are engineered to work as a sealed system. The pumps can be used for the safe transfer of over 1800 industrial chemicals, including the most aggressive acids, caustics and solvents. These pumps function essentially like a beer tap. The operator attaches the pump, presses the plunger several times to build up a low amount of internal pressure, and then dispenses the liquid. The tap is configured to provide precise control over the fluid delivery, from slow (1ML/ 1 oz.) up to 4.5 gallons per minute, depending on viscosity. Because such pumps use very low pressure (<6 PSI) to transfer fluids through the line and contain automatic pressure relief valves, they are safe to use with virtually any container from 2‐gallon jugs to 55-gallon drums. Made in the USA, these durable systems will last for years.